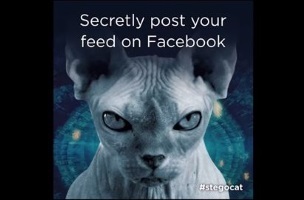 That picture of a cat you’re seeing on Facebook may be more than a picture of a cat. Private messaging application Wickr introduced a photo feed called Wickr Timed Feed, or WTF, that hides private photos behind cat photos on Facebook for 24 hours. Wickr explained how WTF works to TechCrunch, as well as in a video (embedded below): Wickr users can share photos with as many as 151 friends by tapping the WTF tab in the Wickr app, creating and customizing photos, and choosing where to share them (in specific feeds or on Facebook). When photos are posted to Facebook, users who were not chosen to view them only see cat photos. Users who were granted access to the photos can click on the cat photos to access Wickr links and see the actual photos, which remain active for 24 hours. This is the biggest announcement we’ve made since starting the company. Cats are more popular, but dogs can be an in-app purchase. We’ll make Facebook cool again. We’re not expecting to get cut off, but even if we do, it could work out like the David Cameron news. It will just cause more downloads for our app. It took a lot longer to build this than we expected. However, this is a true technology breakthrough. It will be interesting to see how (Facebook) respond(s). Readers: Would you use a feature like Wickr’s WTF?